Warm ups in netball are important because they get your players' muscles ready for exercise and help to reduce the risk of injury. They're also a great way to mentally prepare players for training or their match. The warm up drills, games and videos below will boost your players' fitness and agility while working on their ball skills and movement off the ball. 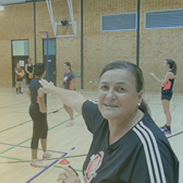 Warm up drills should be used to switch on your players' netball brains - preparing them for the training or match they are about to take part in.